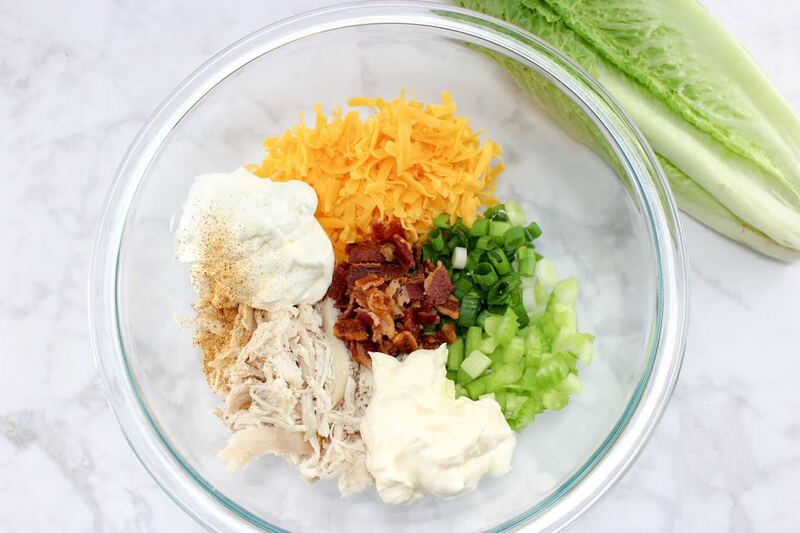 Loaded Chicken Salad Lettuce Wraps are easy AND delicious! I have been on a chicken salad kick lately. I used to love it when I was a kid and for some reason I got away from it for a while. But I am back on it now and I have been making tons of it lately. I usually eat it on bread, but I got this idea make lettuce wraps out of them recently and they came out awesome. Like, seriously awesome. I have eaten these Loaded Chicken Salad Lettuce Wraps every day for a week straight. They are really easy to make and I love that I can make and serve them fairly quickly. 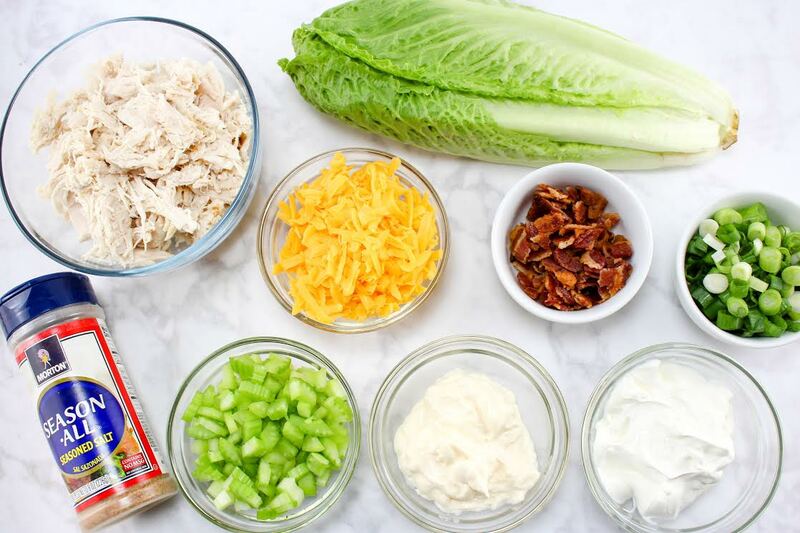 If you like chicken salad, give these loaded chicken salad lettuce wraps a try. 1. Combine all the ingredients, except the lettuce, and stir together until they are well mixed. 2. 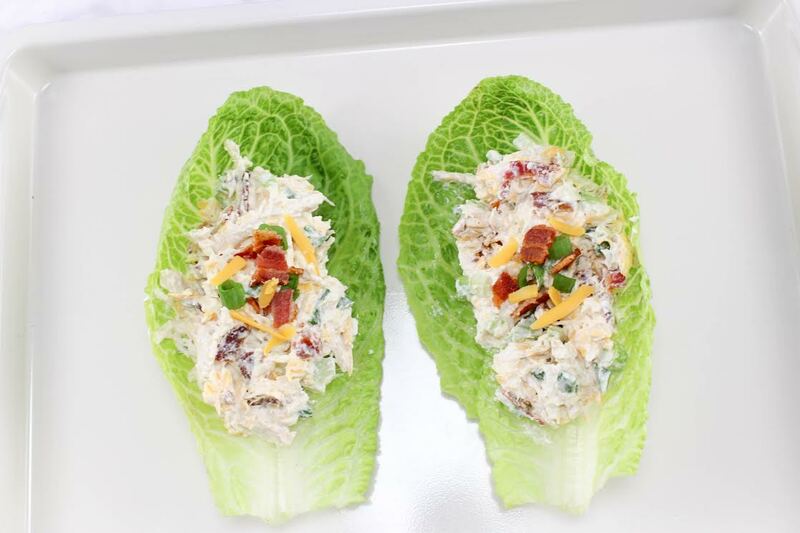 When ready to serve, put a small scoop of the chicken salad onto one of the lettuce leaves and serve. 3. Feel free to garnish with extra onion and bacon pieces if you would like. Everything is better with bacon, right? 4. 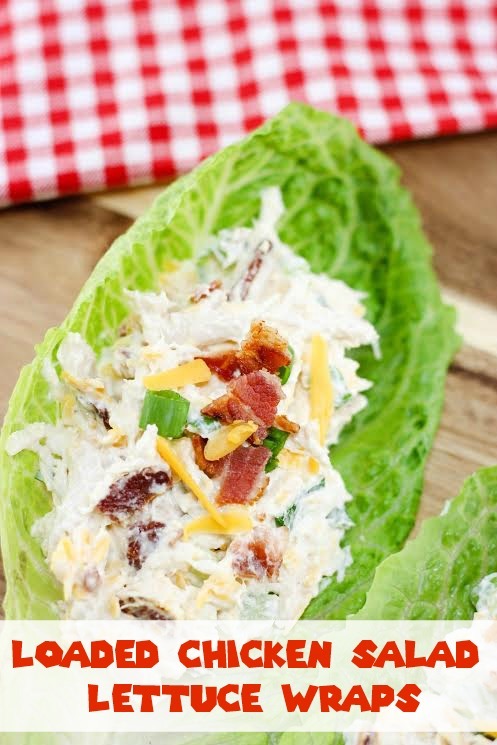 These loaded chicken salad wraps make a delicious light summer meal! I have eaten a lot of chicken salad in my lifetime, but the addition of bacon is fairly new for me. If you have never had bacon with your chicken salad, you are missing out. It’s phenomenal and you should definitely try it. 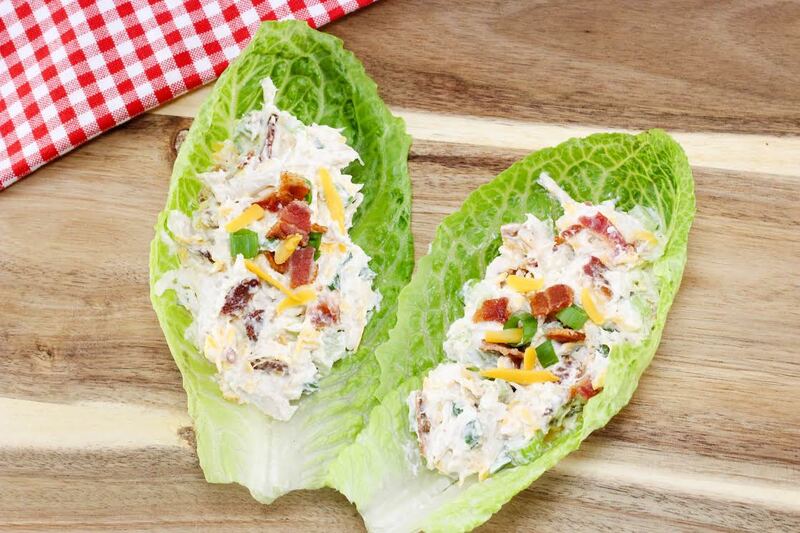 For a tasty meal idea this summer, give these Loaded Chicken Salad Lettuce Wraps a try. I think you’ll like them. This is such a fun way to serve chicken salad! Especially during parties! It’s even better because you don’t need plates. Thanks for the idea! I’ve always liked chicken salad and it’s excellent with bacon and cheese. The lettuce is perfect for those watching their bread intake. Those look amazing! I love all the flavor you managed to pack into one wrap! Your wraps really look delicious! I bet the lettuce adds a wonderful texture and crunch to the sandwich. I can’t wait to share this recipe with my husband and see if he would try this with me because it would be good for me with the Diet I am on and give me something new to eat. With the leftover Lettuce I could make Tuna Salad to serve on it as well. That looks delicious! I love chicken salad sandwiches but I am definitely trying to go on the low carb side. This is a great way to do it. This looks like a keto friendly lunch idea. I’ll have to try it out! I want to make these today! It’s been forever since I have made a chicken salad wrap and it just looks so good! 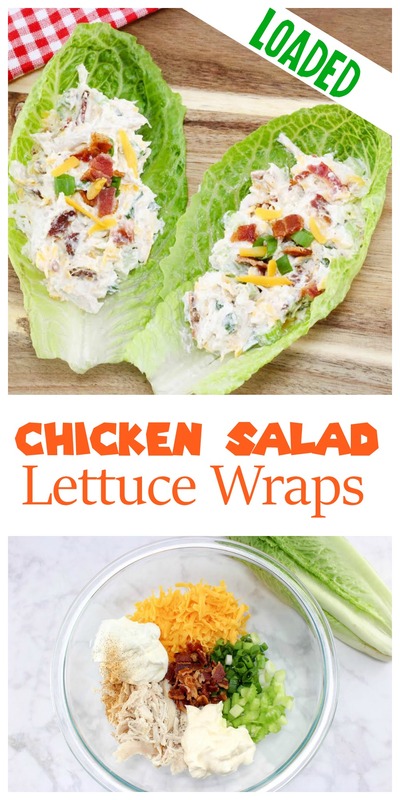 Using lettuce as a wrap is such a great idea and your chicken salad sounds amazing. 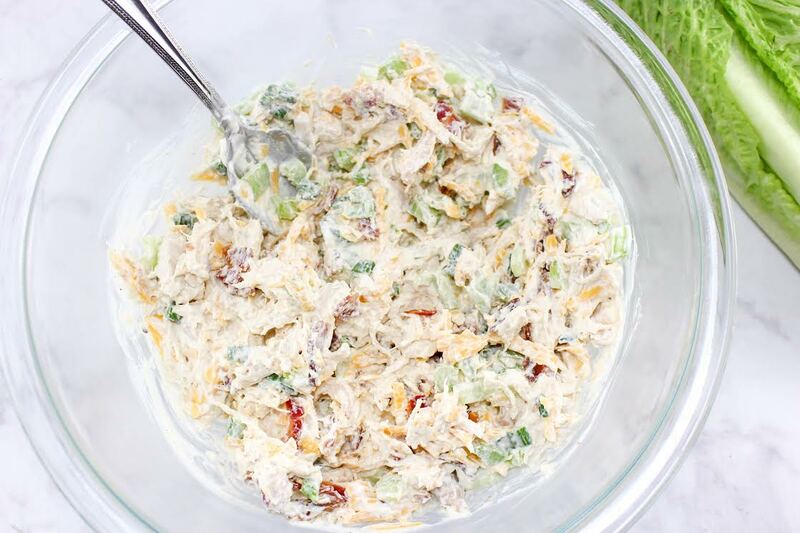 I know that anyone who likes chicken salad will love this recipe. These are right up my alley! I would totally make these for lunch! Chicken salad is one of my favorites. This is a great lunch idea, especially when you don’t want to have a hot meal in this heat. This looks like a perfect summer salad. Everybody in our house loves all these ingredients, too. Yum! This chicken salad is full of deliciousness. A perfect lunch idea for sure. These look amazing! The more loaded the better! All the ingredients with the chicken salad are perfect. I use Romaine Lettuce Leaves for everything, even hamburgers. No bun please! Great recipe – I’ll adopt it! This looks so yummy and it will make the perfect lunch. I have been trying to eat better and I like that this has lettuce instead of bread. Chicken salad is one of our favorite recipes to make at home and it would be nice to use lettuce instead of bread to serve this! Thanks for the idea!! These lettuce wraps look like they would be fantastic. This would make for a great lunch! My kids would love this option! I like changing things up for lunches and think they’d get a real kick out of this one! Looks yummy! Those look so tasty and my type of lunch, yum! I’m making this right now. I absolutely adore salad wraps! I think they make a great snack that’s healthy and simple but jam-packed with flavor. I’ll try your rendition of it this weekend! Oh my, that looks so delicious! What a fun way to enjoy a healthy salad. My kids would love this, for sure. This Chicken Salad Lettuce Wraps looks so hearty. I’m not big on wraps but this is totally calling my name haha! That looks tasty and healthy too! Kinda reminds me of tacos though. These look super yummy! I may go out and make these today for lunch! I’m actually wanting to switch chicken salad for my lunches next week and I was trying to think of how I could have them without having to have bread all the time. I was leaning towards crackers but again with the carbs but doing it as a lettuce wrap is the perfect solution. I’ll be bookmarking this for next week. Now this looks like very refreshing for lunch. I would love to make my husband some of this for the weekend. I love a good lettuce wrap. I will have to do an alternative to the chicken as I do not eat meat. These lettuce wraps look really delicious! I will try your recipe too. Oh and I agree with you, bacon makes everything better! What an easy summer lunch or dinner! I’m wondering why I never thought of this! I’m always looking for new recipes and this one looks and sounds delicious! I would love to try making this.